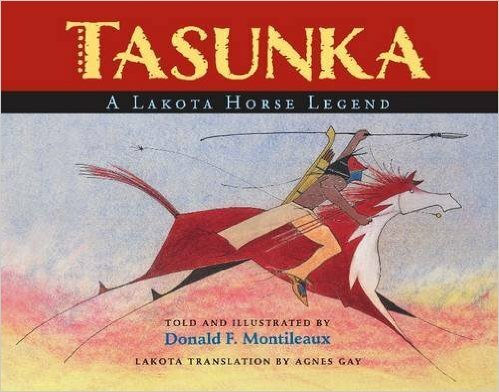 Kidliterati: 10 Native Titles for Gifting! 10 Native Titles for Gifting! Piggy-backing on our amazing! huge! wonderful! lovely! empathy and diversity in kidlit book giveaway last month, here's the perfect list for you to support Native titles this holiday season while also spreading knowledge and awareness. 1. 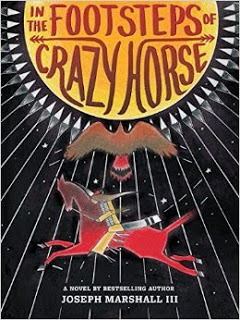 IN THE FOOTSTEPS OF CRAZY HORSE by Joseph Marshall III: Middle Grade. 2. 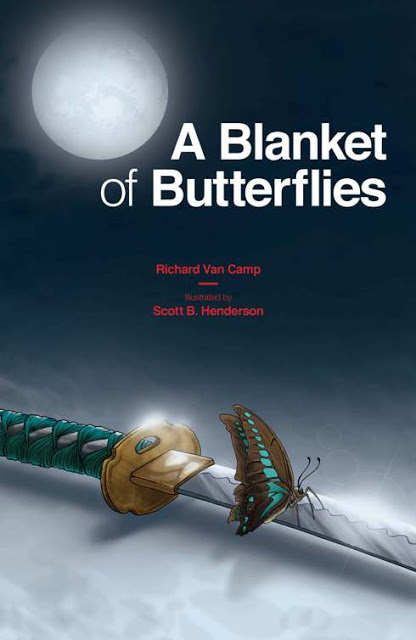 A BLANKET OF BUTTERFLIES by Richard Van Camp: Graphic Novel. 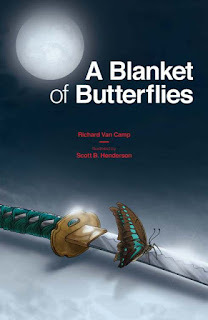 A Blanket of Butterflies explores the journey of Shinobu, a mysterious stranger who visits Fort Smith, NWT, to retrieve his family’s samurai suit of armor and sword from the museum. When he discovers that his grandfather’s sword has been lost in a poker game to the man they call “Benny the Bank,” he sets out to retrieve it, with the help of a young boy, Sonny, and his grandmother. Together, they face Benny and his men, Torchy, Sfen and the giant they call Flinch. This graphic novel, beautifully illustrated by Scott B. Henderson, explores the grace of family and the power of the Great Mystery. 3. 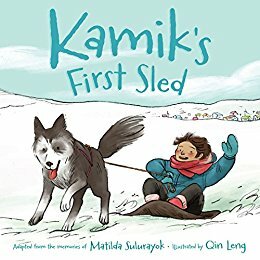 KAMIK'S FIRST SLED by Matilda Sulurayok and Qin Leng: Picture Book. Jake’s puppy Kamik is growing quickly, but the dog isn’t becoming any easier to handle. All Jake wants is to raise his puppy into a strong, fast sled dog, but Kamik is far from ready to pull a sled with a dog team. With some advice and a little help from his grandmother, Jake learns basic principles of how to begin training a dog to pull. Kamik finally has his first sled, and he and Jake can finally begin exploring the tundra together. But Jake and Kamik are still inexperienced, and when a blizzard starts blowing in across the tundra, Jake has to rely on his knowledge to get home. Inspired by the life memories of the author, an Inuit elder, this book lovingly presents basic dog-rearing practices that even the youngest dog lover can try. 4. 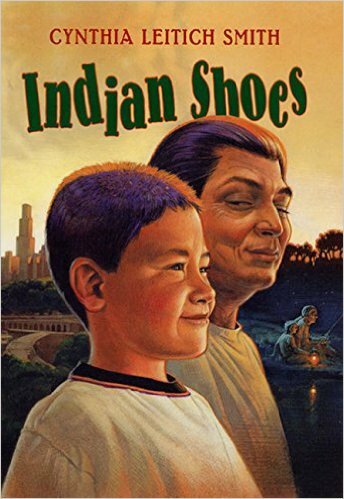 INDIAN SHOES by Cynthia Leitich Smith: Middle Grade. What do Indian shoes look like, anyway? Like beautiful beaded moccasins...or hightops with bright orange shoelaces? Ray Halfmoon prefers hightops, but he gladly trades them for a nice pair of moccasins for his Grampa. After all, it's Grampa Halfmoon who's always there to help Ray get in and out of scrapes -- like the time they are forced to get creative after a homemade haircut makes Ray's head look like a lawn-mowing accident. This collection of interrelated stories is heartwarming and laugh-out-loud funny. Cynthia Leitich Smith writes with wit and candor about what it's like to grow up as a Seminole-Cherokee boy who is just as happy pounding the pavement in windy Chicago as rowing on a take in rural Oklahoma. 5. 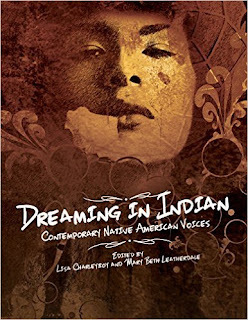 DREAMING IN INDIAN: CONTEMPORARY NATIVE AMERICAN VOICES, edited by Lisa Charleyboy and Mary Beth Leatherdale: Young Adult. Whether discussing the transformative power of art or music, the lasting trauma of residential schools, growing up poor, or achieving success, the contributors to this remarkable anthology all have something in common: a rich Native heritage that has informed who they are. This dynamic, creative work is an interactive portal that introduces readers to the lives of 64 indigenous Native American young people. The writers include an award-winning throat singer, a fashion model, a hip-hop dancer, a tribal leader, an activist, a graphic designer, a comic book creator, a chef, a dancer, a musician, a makeup artist, and a rapper, and the contributors communicate powerfully who they are in their own words and images. 6. 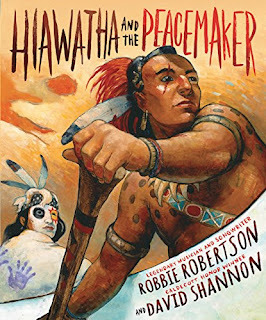 HIAWATHA AND THE PEACEMAKER by Robbie Robertson: Historical, Middle Grade. Caldecott Honor–winning illustrator David Shannon brings the journey of Hiawatha and the Peacemaker to life with arresting oil paintings. Together, the team of Robertson and Shannon has crafted a new children’s classic that will both educate and inspire readers of all ages. 7. TASUNKA: A LAKOTA HORSE LEGEND by Donald F. Montileaux: Picture Book. 8. 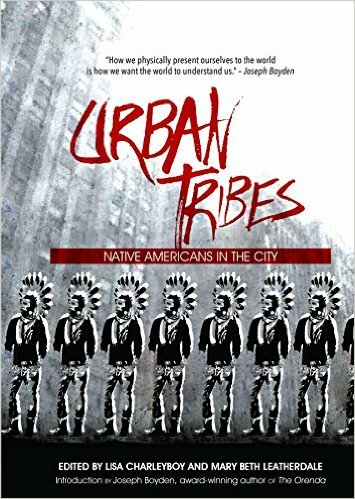 URBAN TRIBES: NATIVE AMERICANS IN THE CITY, edited by Lisa Charleyboy and Mary Beth Leatherdale: Young Adult. Young, urban Natives powerfully show how their culture and values can survive—and enrich—city life. Urban Tribes offers unique insight into this growing and often misperceived group. Emotionally potent and visually arresting, the anthology profiles young urban Natives from across North America, exploring how they connect with Native culture and values in their contemporary lives. Their stories are as diverse as they are. From a young Dene woman pursuing a MBA at Stanford to a Pima photographer in Phoenix to a Mohawk actress in New York, these urban Natives share their unique perspectives to bridge the divide between their past and their future, their cultural home, and their adopted cities. Unflinchingly honest and deeply moving, contributors explore a wide-range of topics. From the trials and tribulations of dating in the city to the alienating experience of leaving a remote reserve to attend high school in the city, from the mainstream success of Electric Pow wow music to the humiliation of dealing with racist school mascots, personal perspectives illuminate larger political issues. An innovative and highly visual design offers a dynamic, reading experience. 9. 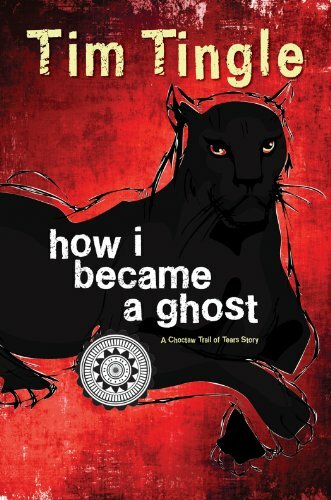 HOW I BECAME A GHOST by Tim Tingle: Middle Grade Series. In this first novel for children by internationally renowned Choctaw storyteller Tim Tingle, a ten-year-old boy tells the story of his tribe’s removal from its Mississippi homeland, and how the Choctaws exodus to the American West led him to become a ghost — one able to help those left behind. 10. TRICKSTER: NATIVE AMERICAN TALES: A GRAPHIC COLLECTION by Matt Dembicki: Folktales, Middle Grade. All cultures have tales of the trickster—a crafty creature or being who uses cunning to get food, steal precious possessions, or simply cause mischief. He disrupts the order of things, often humiliating others and sometimes himself. In Native American traditions, the trickster takes many forms, from coyote or rabbit to raccoon or raven. 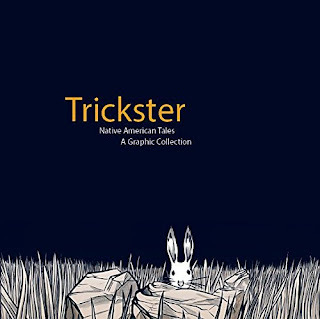 The first graphic anthology of Native American trickster tales, Trickster brings together Native American folklore and the world of comics. In Trickster more than twenty Native American tales are cleverly adapted into comic form. Each story is written by a different Native American storyteller who worked closely with a selected illustrator, a combination that gives each tale a unique and powerful voice and look. Ranging from serious and dramatic to funny and sometimes downright fiendish, these tales bring tricksters back into popular culture in a very vivid form. From an ego-driven social misstep in “Coyote and the Pebbles” to the hijinks of “How Wildcat Caught a Turkey” and the hilarity of “Rabbit’s Choctaw Tail Tale,” Trickster provides entertainment for readers of all ages and backgrounds. For more Native titles, be sure to check out Debbie Reese's recommended/not recommended books of 2015 at American Indians in Children's Literature (AICL). Looking for even more diverse books? Visit the end of year booklist over at We Need Diverse Books!